Lynne Roper, wild swimming blogger and inspirational advocate for outdoor swimming, has died at the young age of 55. Her friend and fellow Devon swimmer Sophie Pierce pays tribute. How to sum up Lynne? When I first met her I was fascinated by her apparent contradictions. A former RAF servicewoman and Margaret Thatcher supporter, she was now a raving leftie (and she’d be very proud to be described as such). She’d gone to art school, but was now a paramedic. She had a particular interest in and love of witches; a witch dolly always hung from the rear view mirror in her beloved camper van. I met her of course, through swimming. She’d turned to the water to help her recover from breast cancer, and a double mastectomy. A few years ago, when the outdoor swimming network was in its infancy, I met her through Facebook. 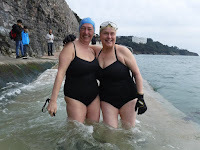 We met with a few others in a windy car park in Torquay one December day, and set off to swim through a natural arch called London Bridge. Around the back of the arch we discovered a cave and swam in, where we got bounced up and down by the swell, narrowly avoiding banging our heads. We laughed hysterically and there was an immediate bond. The waters of Devon ran through Lynne’s blood. She grew up swimming in both the Atlantic off the North coast and English Channel off the South, and she was passionate about Dartmoor and the rivers Tavy and Dart in particular. She lived in a former miner’s cottage on the Moor, which she decorated in her flamboyant style in her favourite colours of pink and blue, with a huge mermaid mosaic she’d made herself in the bathroom. (On her Air BnB listing she proudly said: “I don’t do grey or beige”). 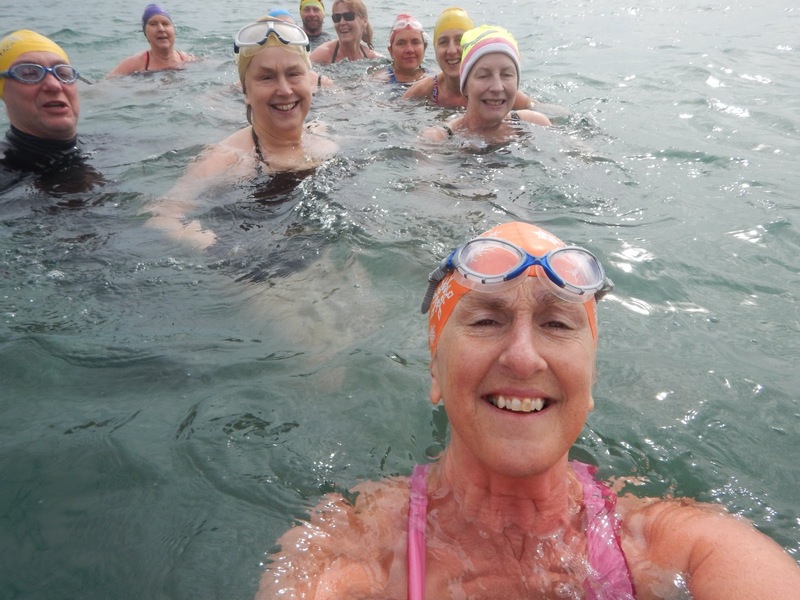 After her double mastectomy, Lynne found that swimming in the rivers of Dartmoor and the seas of Devon gave her both physical and mental therapy – as I think it does for the vast majority of us. 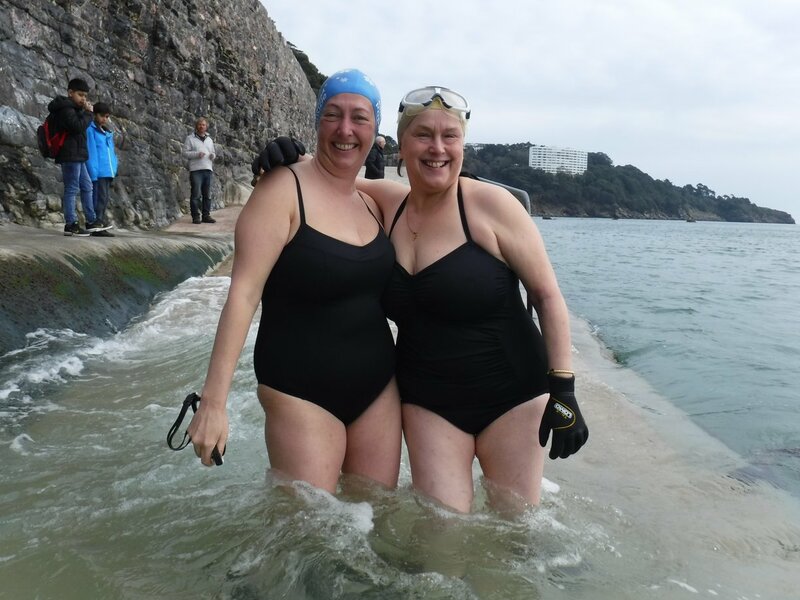 What was so special about her was her ability to translate that feeling into words and to communicate the joy, humour, frequent silliness, camaraderie and all-round life-enhancing qualities of swimming outdoors. She wrote a blog, Wild Woman Swimming https://wildwomanswimming.wordpress.com/ which detailed her many adventures sometimes hilariously, sometimes angrily, always thoughtfully and always articulately. She wrote beautifully, and with originality. I remember one write-up after a particularly exciting low tide swim, when we’d seen a range of marine wildlife including Devonshire cup corals, breadcrumb sponge, and a very rare variety of soft coral called dead men’s fingers which Lynne described as “the same shade of pink as Katie Price’s jodhpurs’. It was a spot-on description too – they were indeed a lurid shocking pink. When she became ill with a brain tumour earlier this year, she turned to writing about both her personal situation and the wider context of the NHS, of which she was a passionate supporter. https://outofmybrains.org/ She christened her tumour Hunt after the Health Secretary, and was furious about what she saw as the ongoing cutbacks and the privatisation of the NHS by the back door. She also wrote movingly about facing her own death. Her blog is now being used to teach medical students. Lynne’s death has shocked our swimming community both here in Devon and wider afield. Locally we have lost a wonderful, witty friend, who made us laugh, led us on many adventures and was always keen to share her wonderful places. Lynne also touched people who never even met her, through her writing and blogging, and through several films and documentaries about wild swimming in which she appeared. One of the most moving tributes has been from a blogger in America who’s never even met her, but felt he knew her. I have so many wonderful memories of swimming with Lynne. Sitting in a hot tub at Slapton Sands, after getting battered by huge rollers crashing onto the shingle shore. Several New Year’s dips followed by raucous warm-ups in the pub. Hikes over Dartmoor followed by plunges in cool rivers and playing in waterfalls. And one incredible dawn swim where we watched the sky gradually turn pink and then slipped into the shining sea.